In doing a bit of research for our next farm project, I found out there is an old saying that goes "Too proud to whitewash, too poor to paint!" Well, we AREN'T too proud to whitewash, and we ARE too poor to paint, so our next project is whitewashing! I know, it's horrible. Chickens and guineas have no boundaries. (One of them pooped right in front of me the other day! They just poop wherever they are!) But they won't lay eggs in boxes that they've pooped in, so we had to clean it up. Plus, all that poop will make some lovely fertilizer. More on that later though. The goats' room also needed some attention. So we cleaned both rooms out. Jeremy got a little upset with me for taking all the hay out of the goats room and laying down new because he had this other plan (would have been nice to hear about it beforehand, but you know). I found out his plan is actually a thing called "deep litter method" which is basically building a compost pile in the chicken coop to compost through the winter. It keeps the coop warmer and you don't have to muck it out. Jeremy's pretty smart. That's what we're doing now. In the coop and the goats' room. Jeremy wants the ground to build up a bit higher in both rooms anyway. We just have to turn the hay every week or so and add more as it gets lower. Now, for why we decided to whitewash everything. Well, we haven't finished replacing all the siding on the garage-turned-barn, because some of the siding will last a bit longer. The siding that has been replaced, and the new walls of the chicken coop and goat room are all still raw and need some protection for this winter. Whitewashing will not protect the exterior walls like paint will, but it will give it some protection for this winter. We can't afford the paint right now to cover everything, and whitewashing is CHEAP. And it'll be easy to wash off with a pressure washer so we can paint it. 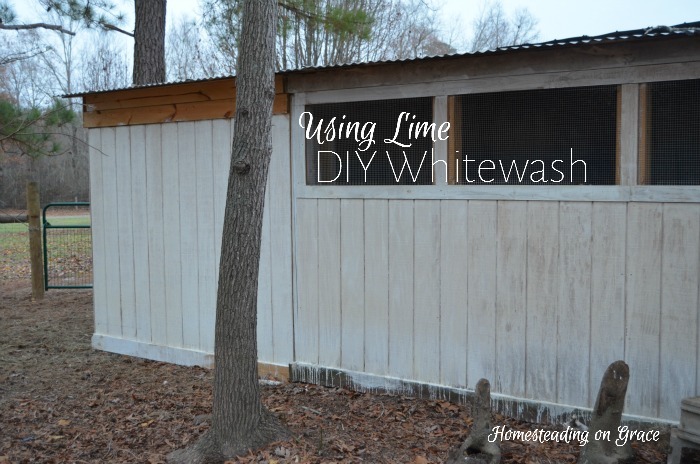 I read about whitewashing here on the Prairie Homestead, and then did a little research on my own and found this from Molly's Herbal's and this from Tiny Farm Blog. She added salt, but from what I read here it's not necessary unless you are also adding a thickening agent, like flour. We just decided to use lime and water. The lime is hydrated, not the garden lime. We mixed 6 heaping cups of lime with a gallon of water. Then we just slathered it on. One of the nice things about whitewashing is you don't have to try to make everything smooth. Lime comes with lots of warnings on the package, as it should, so use your head and be careful when you are messing with it. But don't fear it. It's just best to be careful. Jeremy and the kids feared it. And were a little ridiculous about it. There are plenty more things that we should be afraid of, but aren't. Paint, for one thing. At least with lime, you don't have to worry about any environmental problems. It's pounded up rock, so completely natural. Obviously, Jeremy got over his fear. It took two coats on the outside walls to really start looking good, and the chicken coop still probably needs another coat, but it's looking really good. Another nice thing about whitewashing is you can do it in stages. We didn't get everything done the first day, so Jeremy had to do some more a couple other days. It's not a whole day event either, like painting. Easy to get out, and easy to clean up. This is the best looking wall. It's amazing how white it is. Oh, and it's been raining pretty steady since we did this, a week or so ago and the lime is holding on. There's George! The white hen on the left, she's George. The chickens are very happy, although we've got them locked in the coop to train them to lay their eggs in there. It looks great, although we missed some spots in the coop. We'll just keep whitewashing every once in a while to finish covering the spots and build up the coverage. Have you ever whitewashed anything? This looks great! The inside of our coop needs attention. The outside is rounded logs like a log cabin so it's really cute. It would be nice to brighten the inside a bit! I like the old school look of whitewash. I found you at the Homestead Blog Hop. Thanks for sharing! Thanks Heather, I love the way it looks too. It brightened up the inside for the birds. It's pretty dark in there even during the day. 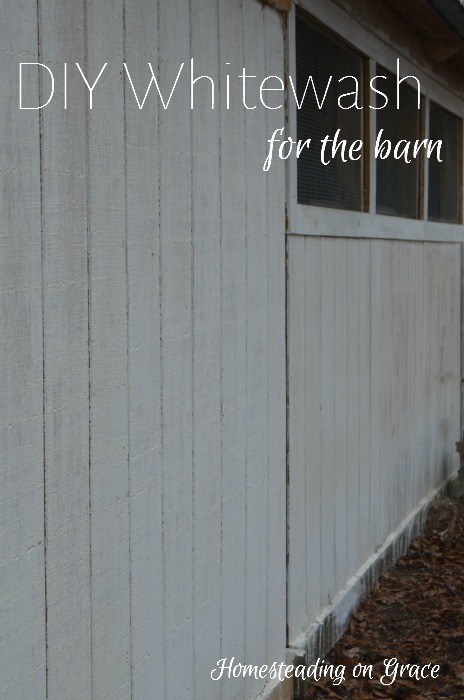 Your coop does sounds really cute, I love the look of long cabins, just like Little House!